The Sweedish short film 'The Burden' by Niki Lindroth Von Bahr has won the Best Film award in Fantoche 2017 . Fantoche has been established 22 years back with the motive of promoting art of animation in all forms and to encourage independent filmmaking. The International Fantoche Festival in Baden is the largest Swiss cultural event with over 300 short films and numerous feature films being presented which gives insight into creative filmmaking from all over the world. 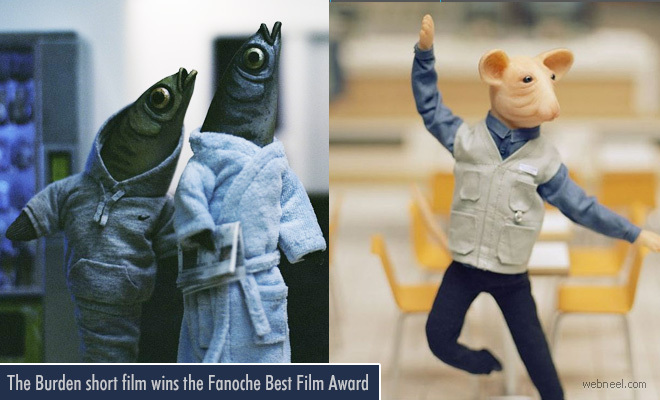 The Fantoche showcases the contemporary animated film and illustrates the varied diversity of this genre. Various types of animation techniques are included in the Faantoche which opens a wide range of exposure to the audience. A complete artistic independence is given in the competition which leads to new innovations. 'The Burden' expresses the feeling of freedom from worries and desire for enjoyable life in this world of false promises by the consumer world. The story revolves around a self-service restaurant, a call centre and a supermarket on the motorway with an apocalyptic music. Ironically, there is a lot to be said about comedies with very little dialogue that make you laugh out loud, especially if you’re giggling at figures that were painstakingly handmade by the film’s creator. With all that talking, you’ve got to get every other aspect of the piece exceedingly right in order to keep your audience captivated. That’s exactly what our Staff Pick Premiere this week, “Bath House,” does in delightful detail. Director and animator Niki Lindroth von Bahr has created a spectacle in this miniature stop-motion world. Here, extended bouts of silence speak much louder than words as an unfortunate series of events unravels for an irritable, but well-meaning horse — who happens to take her job as a public pool manager very seriously. In many ways “Bath House” is a film of juxtapositions; what looks cute and harmless is actually vindictive and selfish, and a public pool — one of the most relaxing and sterile places in any town — is actually a recipe for catastrophe. It’s about the darkly humorous chaos that can happen in an environment where every person (cute furry animal or otherwise) is out to serve themselves first and foremost. “Bath House” was shown at the prestigious Annecy International Animated Film Festival in 2014 and Sundance Film Festival in 2015, and is making its online debut today on Vimeo. We hope you love it as much as we do. Read on for our Q&A with Niki Lindroth von Bahr about how she created this black comedy.